I am so excited because it’s almost summer and I love it! I love being in the sun and lazy pool days! I love cold beverages, hot grills, and cool, breezy dresses. Unfortunately, summer can really do a number on your skin. I, like so many people, didn’t really give my skin health the attention I should have during my teen years. I’ve always hated the way sunscreen feels on my skin, and even when I forced myself to apply it, I usually wouldn’t reapply throughout the day. As an adult, I really try to do better, but I still have a hard time finding a sunscreen that doesn’t feel greasy and sticky. 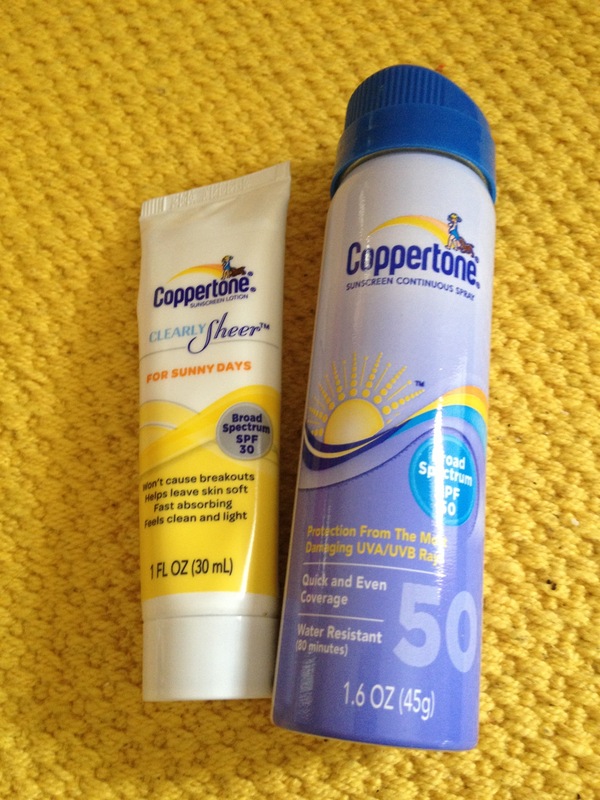 So I was really excited when BzzAgent gave me the opportunity to try the new Coppertone Clearlysheer sunscreen. I was sent both a spray and a lotion to try, also different SPFs, one was 50 and the other was 30. Right away, as soon as I opened them, I noticed the light, clean fragrance and loved it. When I applied the lotion, I noticed it soaked right in and did not leave my skin feeling oily at all. I noticed the same thing with the spray. I liked that they gave me options. I preferred the lotion on dry skin because it made me feel like I was getting good coverage and had more control over where it went. I enjoyed the spray for reapplying, especially on damp skin, and for applying to those hard-to-reach places. It absorbs in seconds for a clean and light feel. Its moisturizing formulas help leave your skin soft and smooth. It won’t clog pores or cause breakouts, and it was even clinically tested on acne prone skin. Its matte finish is perfect for use under makeup. I also have some other exciting news! They sent me some to share with y’all, too! 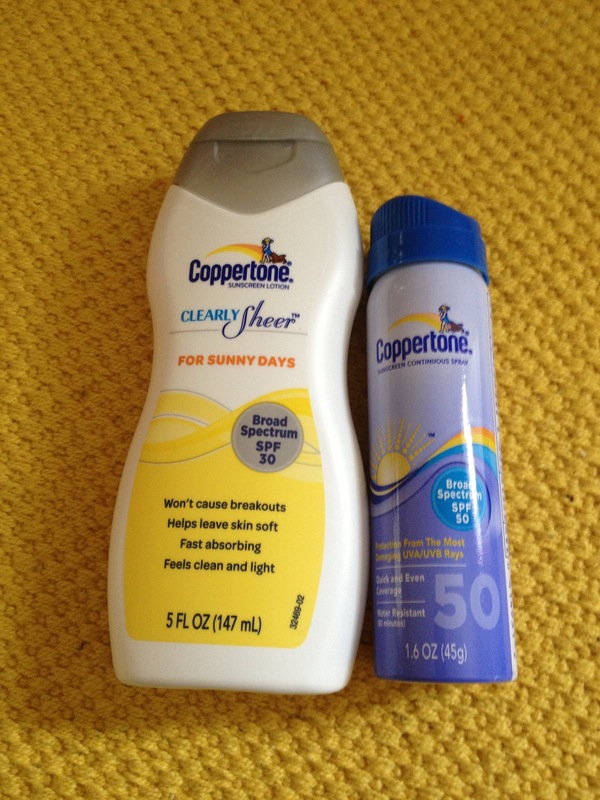 So one lucky reader will recieve a generous sample of both the lotion and the spray. To enter, click on my Rafflecopter link below. The winner will be announced on 6/28/14. All entries will be verified. This sweepstakes is open to US residents with US shipping addresses only and is void where prohibited. Good luck! One lucky ready will win these! Disclosure: The product and coupons were sent to me free to try and share because of a partnership with BzzAgent. I was not compensated or required to write this blog post. All opinions, as always, are my own. I love camping during the summer! There’s a great State Park near us that even has a huge pool, so that makes it even better! I’m a teacher…I enjoy spending my summers being lazy by the pool after a run. I love swimming, gardening, and enjoying the sunshine. I like anything where I can just enjoy the sunshine and warmth! I like to hang out with my children at the pool!! I love going to the pool and the beach! Running in the early morning. Going to the beach and reading a good book. I love the beach & pool and sunshine though fair skinned me sits in the shade of an umbrella unless swimming. I love to go walking in the woods. I am a teacher so I love to be able to float in a pool, go camping, head to Disney, read and relax in a hammock and enjoy the summer weather. Love the laziness of summer! We live in Florida so we love all things water related – beach, pool, water park, etc. Thanks for the giveaway! I love eating outdoors,picnics and bbqs! Swimming and relaxing by the pool. I love to have BBQs out at the lake!